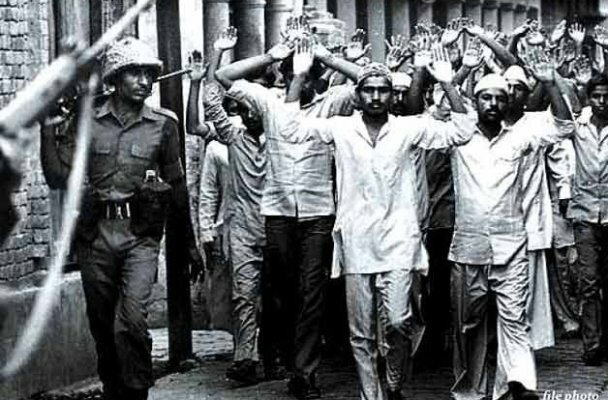 More than 31 years after 38 Muslims from Hashimpura were rounded up and shot dead by the Uttar Pradesh Provincial Armed Constabulary (PAC), the Delhi High Court sent 16 former jawans to life imprisonment, holding them guilty of murder. The incident took place in the evening hours of May 22, 1987, when 42 to 45 elderly men and boys belonging to the Muslim community were rounded up by the PAC personnel, packed into a truck and taken away; 38 of them were later shot in cold blood and the bodies were thrown into the Gang Nahar (canal) and Hindon river. After communal riots had taken over Meerut in April 1987, in a communally charged atmosphere; PAC was called in, but was withdrawn as the riots subsided. However, violence erupted again around 19 May, when 10 people were killed as arson escalated, thus the Army was called out to stage a flag march. Seven companies of CRPF reached the city during the day, while 30 companies of PAC were being rushed in and an indefinite curfew was declared. The following day, mobs burned down Gulmarg cinema hall, and as the death toll rose to 22, plus 75 injured, shoot-at-sight orders were issued on 20 May 1987. On the night of 22 May 1987, 19 PAC personnel, under platoon commander Surinder Pal Singh, rounded up Muslims in the Hashimpur mohalla in Meerut. The old and the children were later separated and let go. They allegedly took about 40–45 of them, mostly day wage labourers and weavers, in a truck to the Upper Ganga canal in Murad Nagar, Ghaziabad district instead of taking them to the police station. Here some were shot, one by one, and thrown into the canal. A bullet also injured one of the PAC constables. After some were killed, the headlights of passing vehicles made PAC personnel flee the spot with those alive. Four of those shot escaped by pretending to be dead and then swimming away; one of them filed a first information report (FIR) at the Murad Nagar Police Station. The remaining men were taken in the truck to the Hindon River Canal near Makanpur village in Ghaziabad, shot and their bodies thrown into the canal. Here again, two of the people who were shot at, survived and lodged an FIR at the Link Road Police Station. This incident can be used in answers related to Judicial Delays, Communalism, Emotional Intelligence etc.